Friday evening we gathered for the official grand opening event at the new VFS Game Design Campus, which has moved to 88 East Pender in Vancouver – the former home of OmniTV. A far cry from the warren-like campus at the corner of Homer and West Hastings, the new campus is the perfect set up for the Game Design program, giving the school room to expand and whittle down its long waiting list of students waiting to unleash their imaginations and creative abilities on the game development industry. 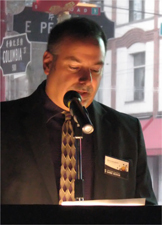 The evening began with opening comments from VFS Managing Director Marty Hasselbach, who was the MC for the event. Mr. Hasselbach spoke briefly about the school and its successes before introducing school founder and President, Mr. James Griffin, who reiterated that one of the major goals for VFS is to teach students for success, something that I feel the school achieves time and again. Following Mr. Griffin was guest of honour, Vancouver Mayor Gregor Robertson. 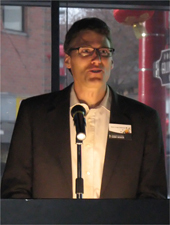 Mayor Robertson spoke to the City of Vancouver’s commitment to the local digital media industry, and the important role Vancouver Film School plays in the continued growth of the industry. Mayor Robertson also spoke to the revitalization of the China Town community, and that the occupation by VFS of the former OmniTV building will assist in breathing new life to the area. Several Vancouver City council members were in attendance, including Suzanne Anton and Ellen Woodsworth – in fact there were so many members of council present, Mayor Robertson joked that they could hold a meeting right there at the school. He continued, stating that the show of support from the council members’ attenda nce speaks directly to how the City is impressed with the remarkable achievements of not only Vancouver Film School, but the creative industry as a whole. The City recognizes the importance of the significant contribution the digital media sector has made to the standing of Vancouver as a global centre for creativity, and it is those successes that drives the City’s efforts in seeking out new opportunities, opening doors to new talent and new companies to come to Vancouver. Also not one to miss an opportunity, Mayor Robertson noted the low carbon footprint of the digital media industry, and how its low impact on the environment will aid in the City’s quest to become the greenest city in the world – and he wasn’t just speaking to the home crowd, according to his bio page on the City’s web site, Mayor Robertson does indeed recognize digital media as being among important green industry sectors. The Mayor concluded his opening speech by congratulating the school on its scholarship initiatives, recognizing in particular the Women In Games Scholarship, the 2011 recipient of which would also be announced during the evening’s festivities. 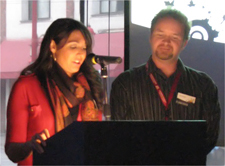 Following Mayor Robertson, the Head of Game Design, Dave Warfield took over the podium to talk specifically about the past, present and future of the VFS Game Design program – after he noted that the campus’ location meant he would have a shorter walk to Canucks’ games. Mr. Warfield spoke about how far the school has come since launching its Game Design program six years ago, and how with the opening of the new campus the school will be able to double its capacity, helping 180 students enter the ever-changing world of game design annually. Mr. Warfield then introduced Women In Games Vancouver representative and independent game producer Bryna Dabby, who announced the winner of the 2011 Women In Games VFS Scholarship. Ms. Dabby spoke about the importance of scholarships like this one, awarding opportunities for more women to become members of what has until recently been a heavily male-dominated sector of the creative industry. The winner of the first Women In Games Scholarship, which was awarded in 2009, was Toronto’s Shannon Lee, who is currently employed at Silicon Sisters Interactive. Last year’s winner, Annie Dickerson of Washington, DC will be graduating from the school this year. The 2011 Women In Games Scholarship goes this year to Larissa Baptista of Rio de Janeiro. While Ms. Baptista was not able to be present for the announcement, the school did release a statement from the young woman, who holds a Bachelor’s Degree in Visual Communication. According to her background information, when she was just 14 years old, Ms. Baptista made a three hour bus commute to attend a year’s worth of classes in 3D software, as she had no other access to either 3D programs or even a computer. Vancouver Film School will also be announcing the winners of three other scholarships to the school provided by G4TechTV, Annex Pro and 3Vis in the very near future. The VFS Summer Intensives Program is also now open for registration – students can experience 5 days of fast-paced, eye-opening classes in any one of the many programs offered at Vancouver Film School. Following the scholarship announcement, Mayor Robertson, James Griffin, Dave Warfield and Marty Hasselbach all took the stage for the official ribbon cutting ceremony, which was then followed by tours of the new school classrooms, labs, offices, arcades and theatre. As we here at Village Gamer look at new ways to form partnerships and support the VFS programs and students, we wish the school every success as it embarks on this new chapter in its history. This entry was posted on Sunday, May 1st, 2011 at 1:39 pm and is filed under Careers, Education, Events, National News, scholarships. You can follow any responses to this entry through the RSS 2.0 feed. You can leave a response, or trackback from your own site.